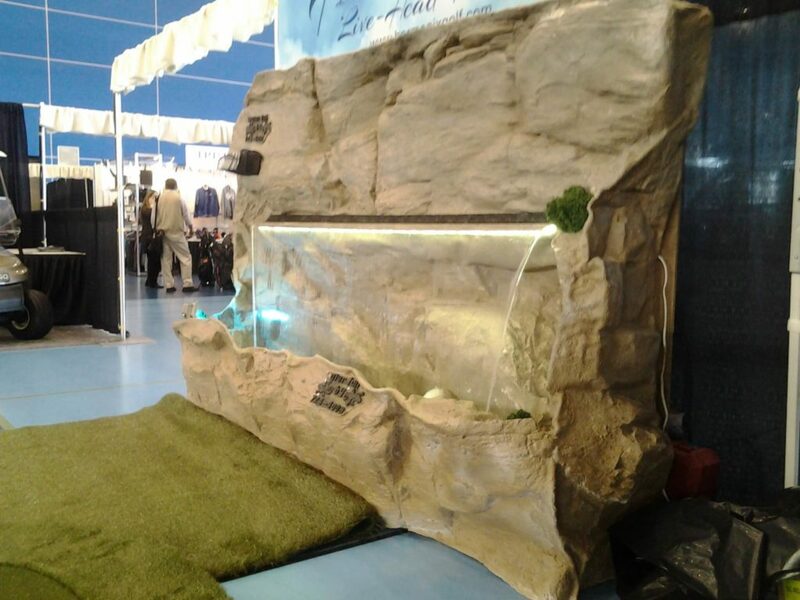 WaterfallNow builds custom made display booths and tradeshow booths. Custom made on-site or built and shipped out. These are lightweight and reusable for future displays. Smaller popup stand displays can also be custom made. We build them indoors, outdoors, and anywhere else you need. We can work with the mold you provide for more unique designs or build one from our shop. Everything we build is done on-site or shipped. Endless possibilities. 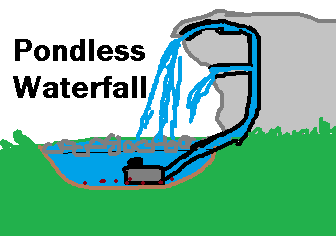 With water feature or without. 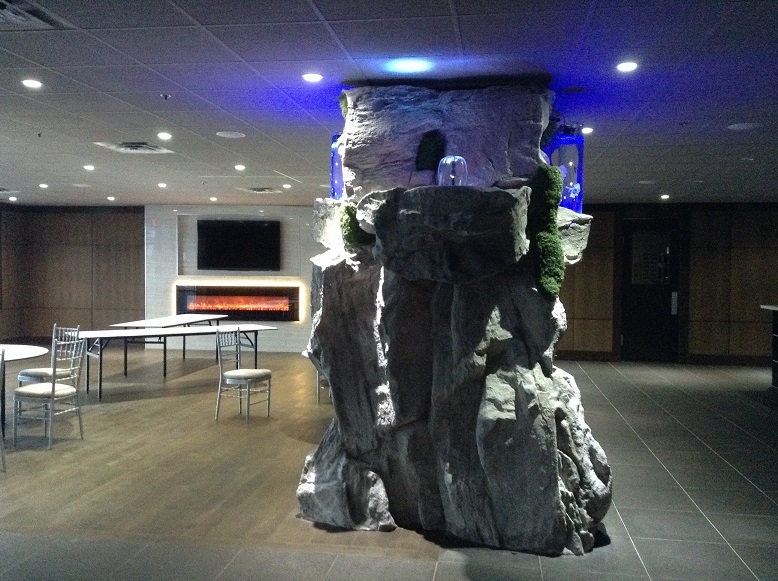 Trade Show fiberglass rock display booths are built in BC, Canada and shipped globally. 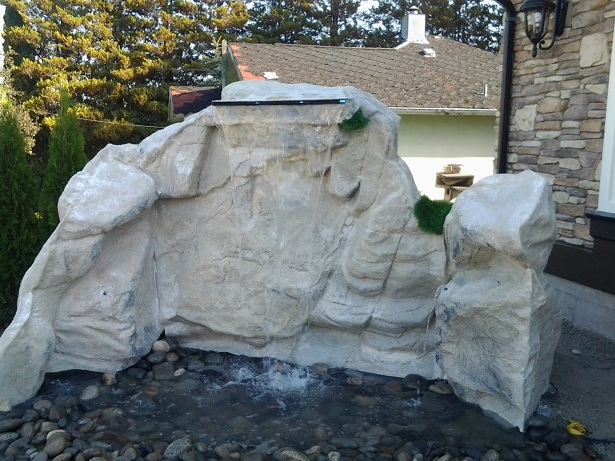 We’ve built rock water features for Korea, China, UK, USA, Canada, Dubai, and more. One of the many advantages of artificial rocks or man-made rocks is that they can be made to can be made to any shape or size. Where real rocks often come in random shapes and sizes, they are often not as easy to manipulate as artificial rocks despite a mason’s best efforts. There are many different types of artificial rocks. 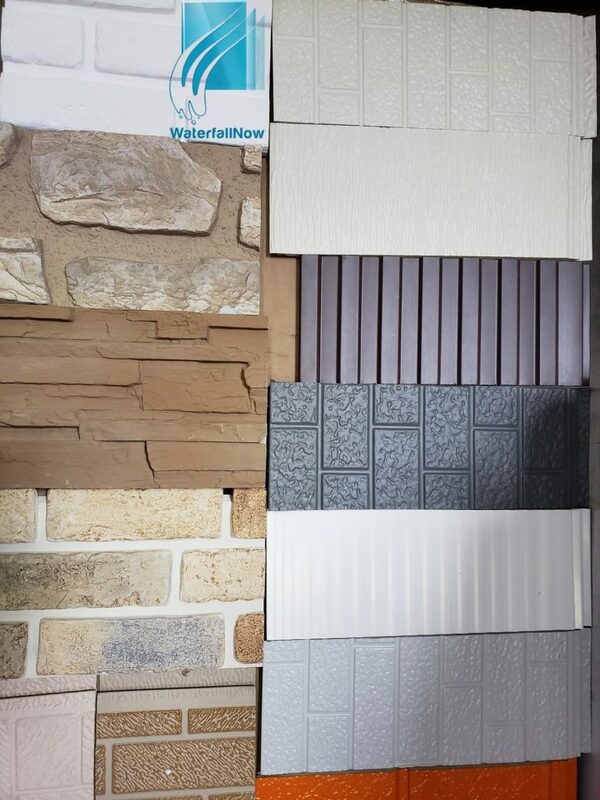 The most popular being shotcrete, GFRC rock paneling, polyurethane foam, styrofoam, plastic, or fiberglass panels which is what WaterfallNow specializes in. Natural stone can only stack so high and comes in limited supply depending on where one is located. It requires a lot of manpower as well as heavy machinery. 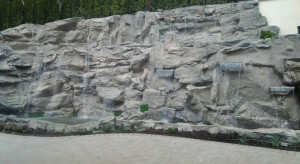 While we appreciate the beauty of natural rocks, we noticed over 30 years of landscaping, that many water features made with natural stone tend to operate for 2-3 years until they run into ongoing maintenance issues. 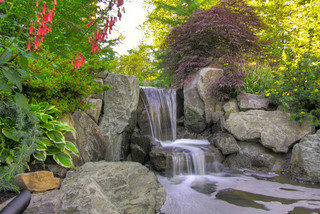 Artificial rocks can be designed as pondless waterfalls to reduce maintenance and maximize uptime. Artificial rocks weigh less than natural rocks which can require heavy equipment and machinery to maneuver. Fake rocks such as foam or fiberglass rocks can be lifted by a single person with ease. Shotcrete rocks are sprayed on-site into a rebar structure and then carved. One of the major disadvantages with concrete is their tendency to crack. It is often common for most swimming pool water features to be constructed using concrete. This because most concrete contractors specialize in building swimming pools already. 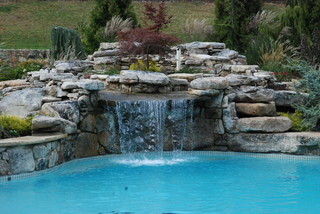 This isn’t however to say that a swimming pool water feature is always best built with shotcrete. There are instances where due to large size, it is better to use a hollow structure that is far more cost efficient and affordable. Weight is not an issue with fiberglass rocks so a special permit is not required. The creation of large overhangs is much more affordable and safer overall when using artificial rock (hollowed out) as opposed to natural stone which can crack, fall, and potentially crush whoever is underneath. 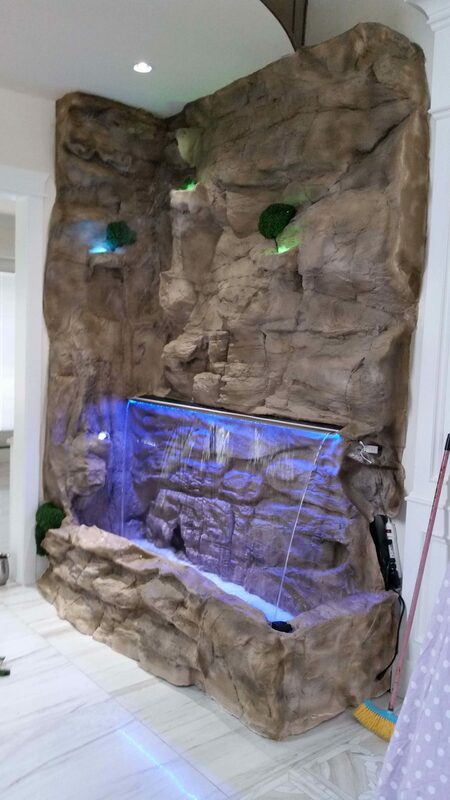 Artificial rocks can come in any number of colors. Special paints and coatings can be applied to create realistic rock surfaces that you cannot tell apart from real rocks. Another advantage of artificial rocks is that you can change their color from one year to the next. Tired of brown? The contractor can simply paint over top to another desired color. WaterfallNow uses a special compound that allows algae to form on the rocks which creates a more realistic appearance over time. Fiberglass for example is an extremely durable material. When hardened it is pound for pound many times stronger than steel. It is very water resistant and not prone to cracking due to freeze-thaw action in freezing climates. It also lasts in hot climates. When built to a commercial thickness, water features made using fiberglass can last for many decades without need of repairs. 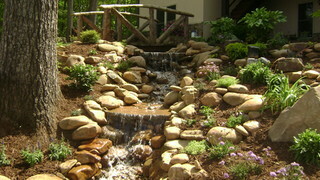 Plumbing is protected and easily accessible with pondless waterfalls built using fiberglass. An access to the inner workings can always be made available. On the other hand, internal plumbing issues can be costly to remedy with shotcrete rocks should there be a hidden leak somewhere inside the structure. Once the concrete hardens, it is difficult and costly to repair. 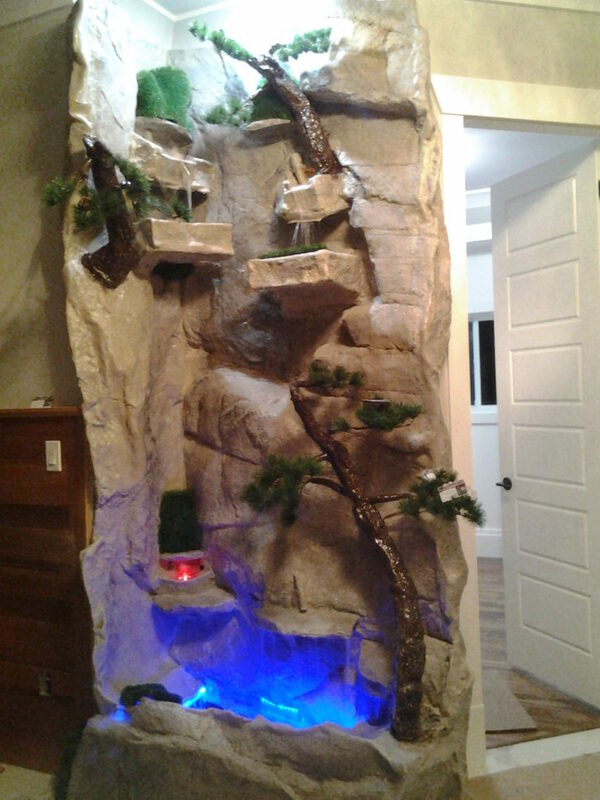 You can put artificial rocks anywhere. They can even go in small doorways where natural rocks cannot pass through, rooftops where you can crane up the lightweight artificial rocks, in malls, amusement parks, theme parks, hotels, and anywhere else you can imagine would be suitable. They can be made to be hollow and used as covers for electrical or manholes. Concrete rocks are recommended for walkways whereas fiberglass rocks are recommended for decorative elements such as to build the caves, overhangs, and rock walls. The versatility of fiberglass allows contractors to add in custom elements such as LED lighting and other features even after construction has finished. One can simply cut into the fiberglass, add the elements, and then re finish the area. 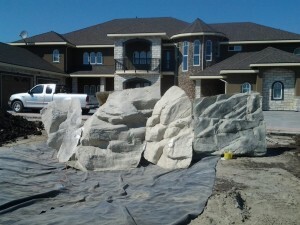 Artificial rock contractors can imitate natural rock patterns to add onto existing natural rock features. 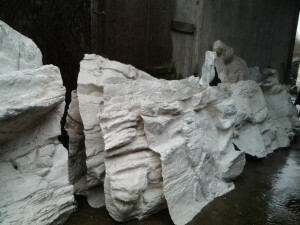 With a fiberglass molded rock, you essentially have a rock face that is identical to that of real rock. Shotcrete does not have this advantage and the rock texture is really up to the individual artist to carve out realistic patterns which is not always easy to do. This is apparent on larger rockwork where one portion may look completely different from another and inconsistent as different workers have different levels of talent. Sometimes, it is recommended to have a concrete contractor working with other contractors (polyurethane foam or fiberglass) where one focuses on the paving and the other focuses on creating the rock caves and walls. There are advantages and disadvantages to both concrete and fiberglass but they balance eachother out when combined. Special resins and paints are available to reduce the shine from fiberglass rocks. 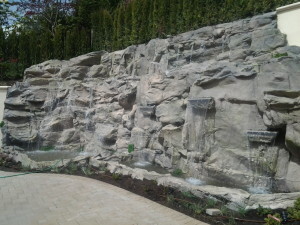 There are definitely great instances of shotcrete used for decorative purposes. Many of the world’s most famous amusement park water features (Big Thunder Mountain @ Disney Land) were designed using shotcrete. Real rocks would be financially unrealistic or impossible as a solution for most largescale projects. 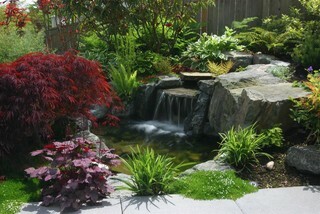 The biggest advantage of artificial rocks is their lower cost in comparison to real rocks. For the same price you can expect a rock that is over 50% larger if you choose to go with artificial rock at a lower price. This is because there is less need for heavy machinery, labourers, and manpower. Fiberglass is one of the most cost effective solutions that we currently offer and specialize in because of the competitive pricing and due to the fact that there are very few competitors. Nearly 90% of all of WaterfallNow’s work is made using a special fiberglass reinforced rock. 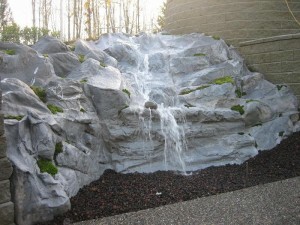 Cave rock or custom pool rock waterfalls always range in pricing and there is no real set standard pricing. It is up to the contractors experience, labour costs, material costs, time, overhead, and more to determine what they need to charge in order to make a profit. Fortunately WaterfallNow has this all figured out and operates with small but highly skilled crews that works year-round. Our simple yet effective process allows us to cost 50% less than the next leading competitor for artificial rock projects. 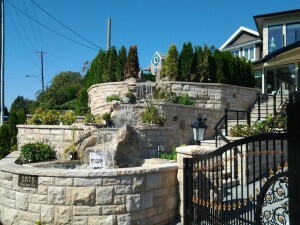 Turn a boring landscape into something extraordinary with the addition of a custom artificial rock water feature. There are no limits to the possibilities and custom options. Except maybe your budget – Let’s be real here. Call WaterfallNow for your free estimate today. Some photos to show you why most companies do not touch fiberglass. It is a VERY messy process to create the rock panels. 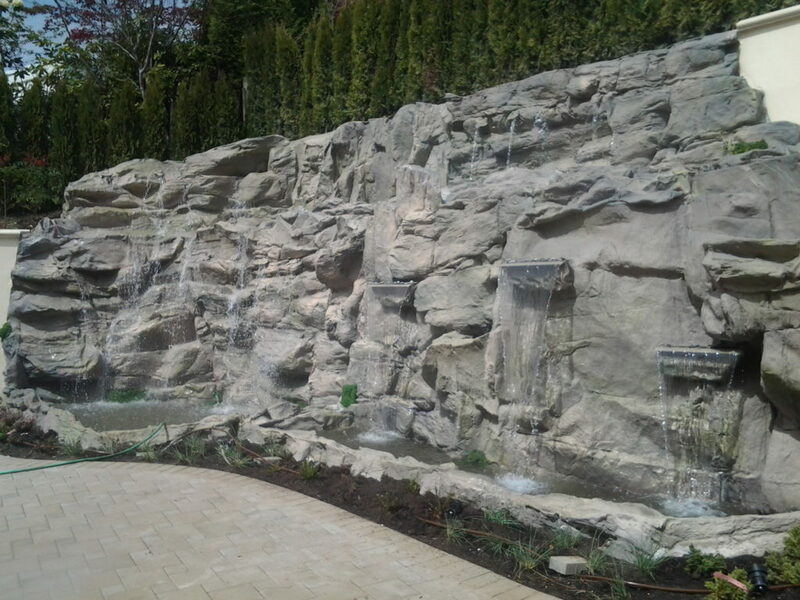 WaterfallNow’s designers have manufactured over 90% of the fiberglass rock panels used, locally, in Surrey, BC for many years. 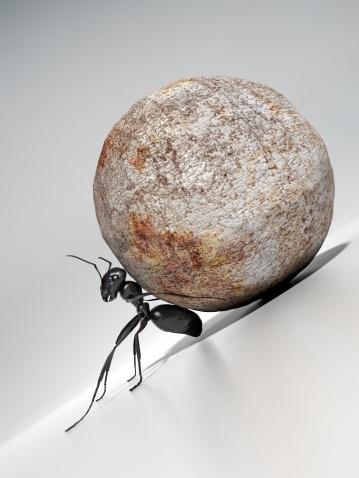 We can attest to the difficulty of the process and how damaging it can be on ones health. For this reason we do not employ entry level workers and prefer to do all of our manufacturing ourselves which is also a factor in our competitive pricing. 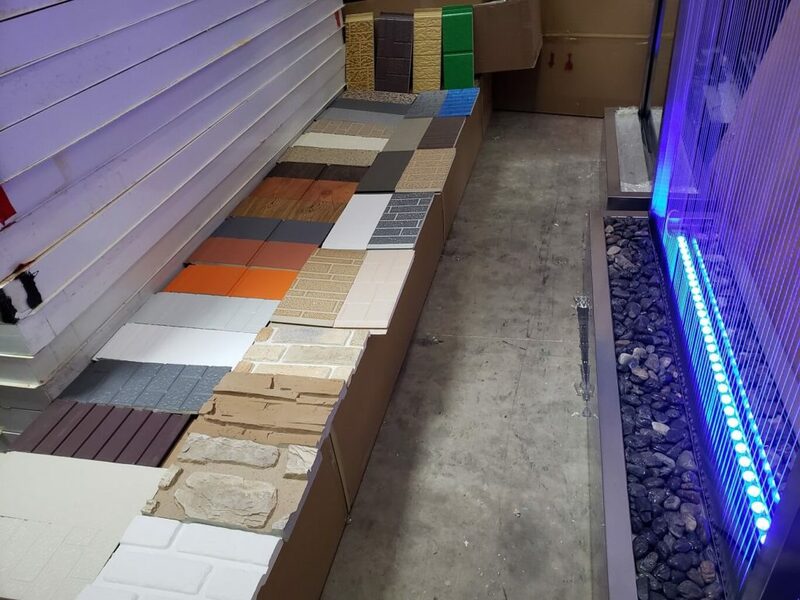 We purchase resin and fiberglass materials from China and manufacture our rock panels locally according to specific needs of our local clients. 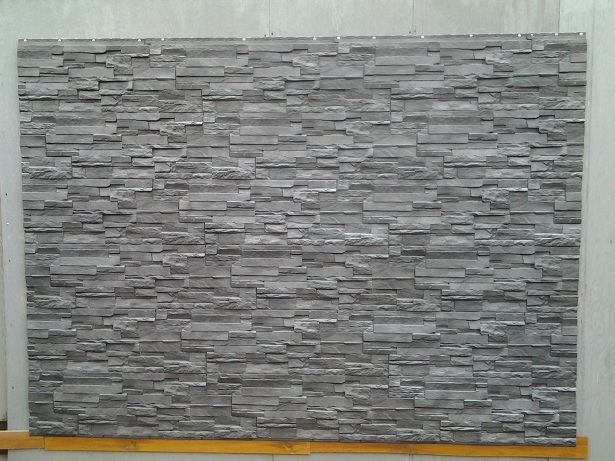 On any given day we can produce dozens of artificial rock panels. Each panel weighs less than 80lbs.